On this picture, you can see Oldus and Berithe harvesting barley on the fields of the farmer they served as husmenn under. The third person is Berithes mother Maren Maria. Berithe Andersdatter was born and raised in Gryllefjord on the island Senja in 1890. 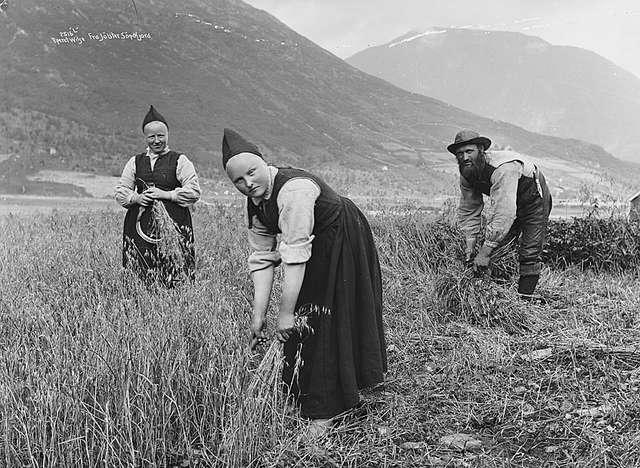 As a young woman she moved to Lofoten to be a cook for the men that worked as fishermen during the winter-season. There were thousands of men there in the winter, and a lot of woman had their work there as long as log as it was "skrei-fiske". She met her husband in Svolvær i Lofoten.